If your antivirus is still flagging the Mod Manager, I've added a "Classic" edition that does not include the MaterialSkin.dll at all. Fixed ScoreSaber not appearing in the mods list. Fixed InstallPath not saving on startup. Thanks AtiLion! Updated installer to not force-install BSIPA. Thanks daNike! Fixed installer crash when no infolink was provided. Thanks raftario! Added additional debug buttons to the Options tab. Selected mods are now saved whenever you click the "Install / Update" button. The same mods will be selected the next time you launch the Mod Manager. Thanks Skattered! 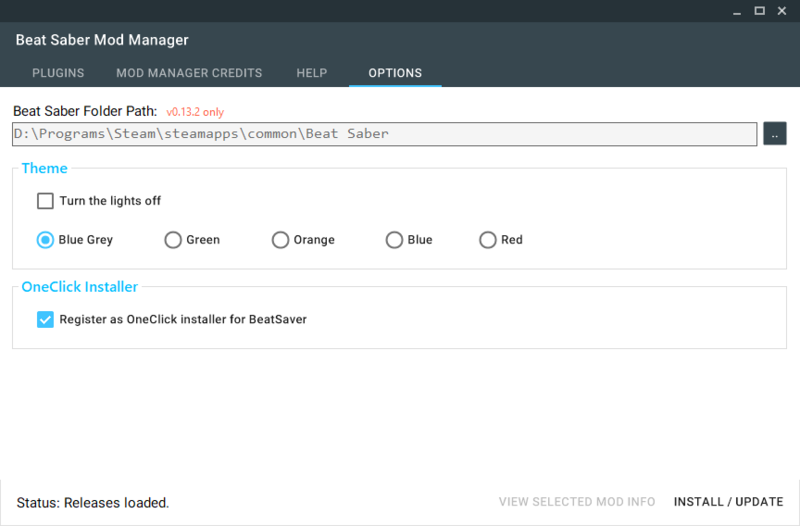 You can now register the Mod Manager as the One Click Installer for both BeatSaver (and ModelSaber) in the Options tab. Thanks Splamy! (Hopefully) fixed AV software flagging the Mod Manager as malware due to ILMerge. This build was created using Constura / Fody instead. Thanks moon#0002! EDIT: If your antivirus is seeing this as malware, it is likely because I have combined the MaterialSkin.dll into the BeatSaberModManager.exe to produce a single .exe file. Here is a version of this release that doesn't bundle the two files together. Theme overhaul by LiNCHx using the winforms MaterialSkin by IgnaceMaes! You can select from multiple themes, and even enable dark theme. Mod descriptions are now shown in a tooltip when you hover over the mod's name in the list. The "VIEW SELECTED MOD INFO" button now opens the selected mod's link returned by the BeatMods api. This is usually the github repo where the source / readme for that mod can be found. Removed the popup panel for mod descriptions. Moved the "Direct Download" button into the right click menu. Right click on any mod and click "Direct Download" and it will open the link in a new browser window. More verbose connection error messages. 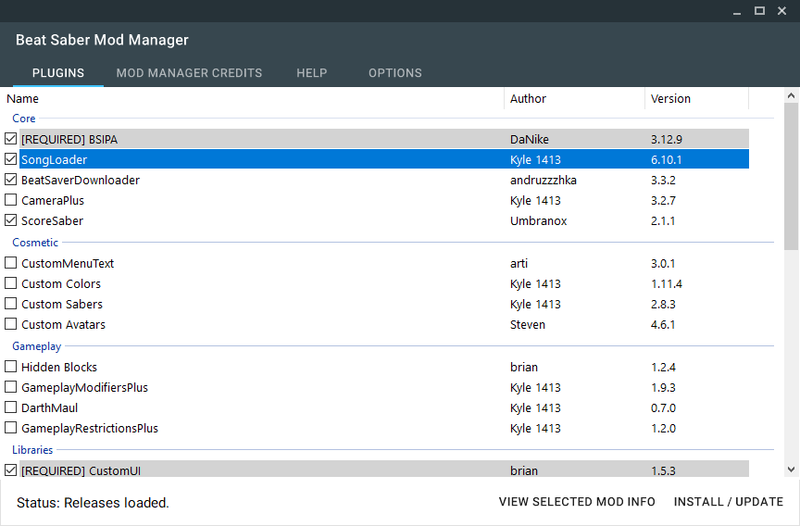 Revamped Mod Manager Credits page. EDIT: The new theme uses an external DLL MaterialSkin.dll, so I am bundling that into the BeatSaberModManager.exe using ILMerge. I believe this might be flagging some anti-virus software, but we'll see if that changes as more people download the file. Proper dependency handling thanks to Assistant! Fixed downloading wrong dll for ScoreSaber. The Mod Manager will now download the correct platform specific files!